Hi, I'm Tod Foley. I'm a game designer and interactive developer, creator of DayTrippers (a surreal science-fiction reality-hopping RPG), Watch the World Die (a collaborative apocalypse-generation game), CyberSpace (an old-school cyberpunk RPG), the World of South Park (an online environment for Comedy Central), various RPG systems and adventure modules for Iron Crown Enterprises, and many other interactive things. This is my "skunkworks" Patreon, which is to say, it's the place where I share bleeding-edge game-related software, game design theory, play aides for assorted games, and experimental game designs that aren't handled by my other Patreons. Fractopia - the facts of tomorrow in the fiction of today. 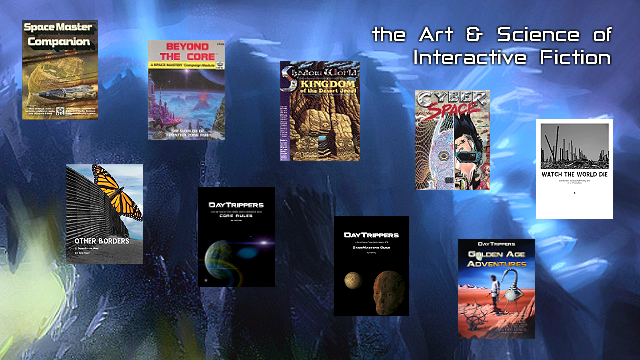 Your contributions, small or large, enable me to continue pushing the envelope of interactive narrative design and theory, as opposed to pushing pixels around in the ever-more-automated field of web development. I thank you for that. At this point I can justify a subscription to Adobe InDesign, which will make my layouts better and easier to create. Goodbye Scribus!